I have been a gnome user for nearly the past two years. Having started my Linux experience with Ubuntu, which shipped gnome as default, I never felt the need to switch. There was nothing the Windows XP DE provided (and I used) that was missing in gnome. Wireless with network-manager was the only problem that I encoutered however I soon found an excellent alternative in WICD – and that has been the default for me from then. It took a while to compile (:P) and the download speed was legendary ( <20 kbps) so it was ready when I woke up the next morning. No idea how long it took to compile (luckily there were no breakages during the night). Well, I changed the default login manager to kdm, logged out and was presented with the kdm login screen. Nothing special there, no difference in functionality compared to gdm. Well, I logged in and the default KDE4.1 splash screen was definitely very nice eye candy. Defintely better than the default gnome splash screen. The default wallpaper was quite artistic as well. Surprisingly, it read my gnome-session properties. I had a few scripts added to the startup and they were executed in KDE as well. That was quite nice. So, a side by side comparison of the apps that are provided in the DE. kwin and Metacity (kwin is supposed to have compisite effects, but it does not work for me, so I do not know. :P) Other than that, it works fine. Multimedia Keys (kde) < Multimedia Keys (in gnome) -> I have set the preferences for volume control at least a couple of times in systemsettings and it seems to stop working after some time. No dea why. HAL Integration (kde) < HAL integration (gnome) -> First of all, no external drives would be automounted by default. It pops up in this new device notifier where you have to click on the new device to mount it. I mean, what the hell is this. If I plug in an external hard drive, I want it to be mounted and not wait for me to tell it to mount itself. Secondly, my windows partition is not mounted by default. It pops up in the new device notifier when I log in, but when I click on it, it tells me something about having to thing extra options. So, I have to mount it manually. Quite irritating. Plasma Panels > gnome panel. Not a surprise considering they were working on it for so long and it was one of the major feature of 4.0. Konqueror and Kmail I did not try, same with kopete. Firefox, Thunderbird and Pidgin work for me. As for the default audio player, I do not know why JuK is installed. It is of no use, when Amarok is there. Other than that, there is not much of a difference, and it did not take me (I have never used KDE before) to get used to the settings and all. But, I must say, that the system responsiveness of KDE4.1 is better than that of gnome-2.22. It loads at a faster rate, and is faster when it run as well. And of course, the looks and the finish are better than gnome, in my opinion. Therefore, this time it looks like that kde4.1 is there on my computer to stay. 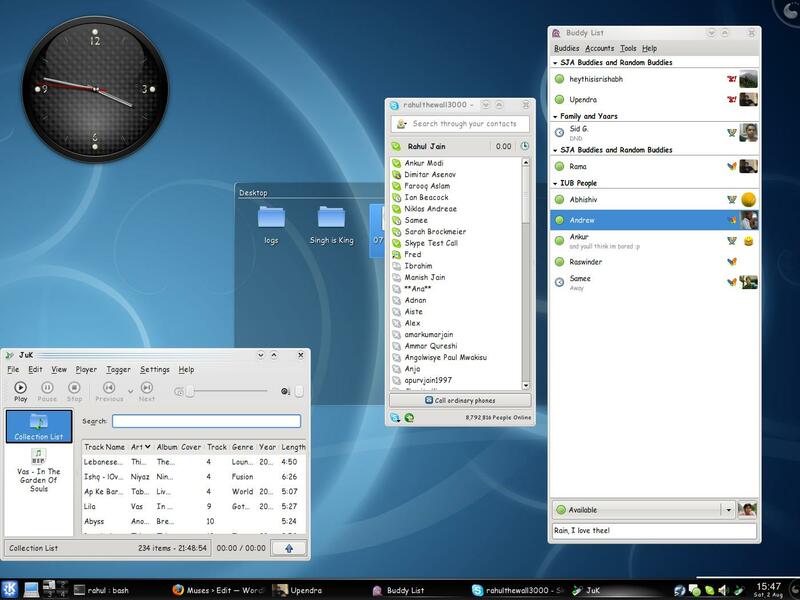 Below is a screenshot of my desktop with one gtk app, one qt app, and one native kde4 app.